Oz is a great sport and trad area of Redrocks. Only 30 feet tall, it is short but sweet for slab and crack climbs. Also, it is a great alternative for when main crag is end to end with TRs. It is pretty shady here, but most of the rock dries pretty quick. TR anchors present fall of 2011. There are also some awesome boulder problems that run across the top of this crag. Follow the trail marked with tape either from the left side of auntie em, or from the right side of the crag starting at oz boulder. A. Commander Salamander Slab, 9, 1p, 25', TR. B. Commander Salamander Crack, 6, 1p, 20', gear or TR. C. Oz Slab, 11, 1p, 30', TR. D. Emerald City, 7 PG-13, 1p, 25', bolt/gear. E. Scarecrow, 9, 1p, 25', bolts. F. Yellow Brick Road, 8+, 1p, 25', bolts. G1. Ruby Slippers, 10+, 1[, 25', bolts. G2. Tin Man, 8, 1p, 25', gear or TR. H. Flying Monkey, 6, 1p, 20', bolts. I. Munchkin, 9, 1p, 15', TR. J. Oil Can, 11, 1p, 15', gear or TR. K. Lollipop Gang, 8, 1p, 15', TR. L. Dorothy, 6, 1p, 15', gear or TR. M. Toto, 8, 1p, 20', gear and bolt. N. Man Behind the Curtain, 6, 1p, 20', gear. O. Oz Chimney, V0, 10'. P. Oz Boulder, V1, 8'. Close by to the north is the Down Under area. Park in the same lot as if you were heading to Main Wall or Pink Floyd Wall from Redrock. 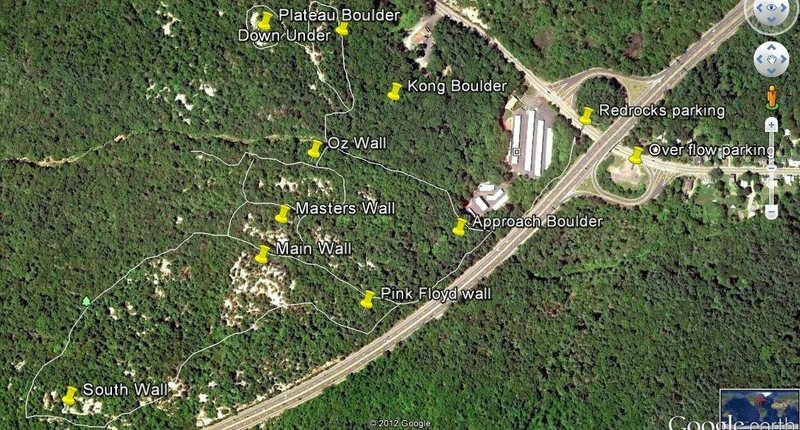 Follow the main trail west along Route 128 from the parking lot until you pass the storage units. Turn north and go around the storage unit to get to the pipeline trail. Once on the pipe line, follow about 100 yards uphill until you see a tree stand in a tree 10 feet up on the right, Oz is about 50 feet in the woods to your left. It is approximately 1/3 mile from parking lot. You can also get to Oz from main crag of Redrock by following the trail past the north end and Master's Wall east. It is approximately 150 yards. Redrocks Conservation Area... much more than just Main Wall and Pink Floyd Wall. Looking right from Emerald City.